Downsize with a Family. We Did it, So Can You. Two years ago we moved into a whole new house. A house with 2,000 less finished square feet than our previous house. Our plan was for a new beginning, a fresh start and a simpler way of living. We never could have imagined the big time changes that were about to take place in our home and in our lives. In the midst of this massive minimalist movement, a lot of people are asking themselves, “Is it worth it?” “Will I regret it?” These are the thoughts I know I had. I craved a downsized life, but, was it worth it? Do we regret it? 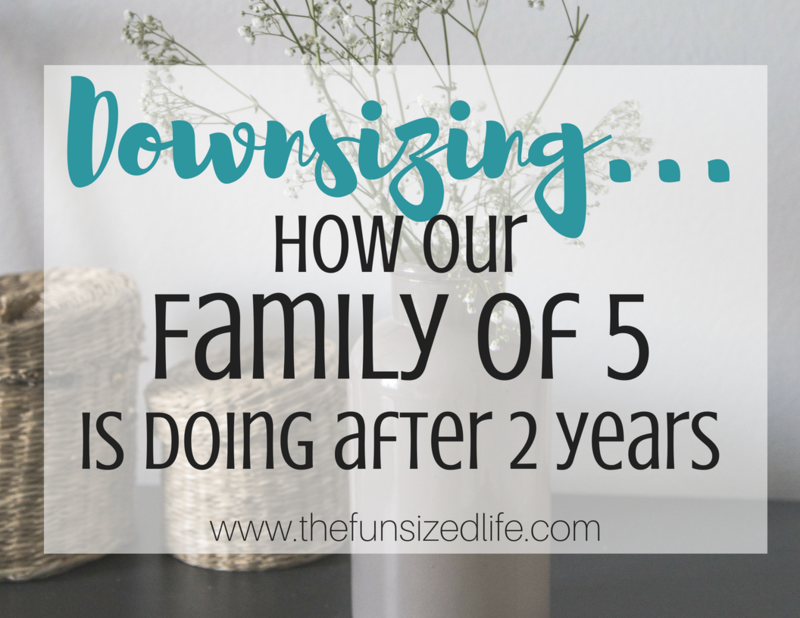 Let’s talk downsized and how our family of 5 is doing after 2 years. *This post contains affiliate links through which I may make a commission. However, all thoughts and opinions are my own. I shared out entire story of downsizing recently on the site, Making Sense of Cents. If you haven’t heard the whole story yet, I would love to share with you where we came from and why we decided to downsize. After we sold our house, we had some serious goals for our house, life and our debt. We wanted downsizing to be the start of a new beginning for us. We had gotten so much wrong before and we were finally ready to start making things right. Our house would immediately be a home. All decor would have purpose and meaning. No money would be spent on new furniture. Anything we wanted we would save for. We used the Sinking Funds method. So where are we at now? You know what got us here, but how are we doing after all these changes? Our little 1,300 square foot starter home still hasn’t had many upgrades. When we first moved in we painted the walls and added a few lighting fixtures. Nothing too fancy. The plan from here is to paint the kitchen cabinets, add in new flooring and eventually finish the basement and add a patio. However, we are in no rush to accomplish these things. We spend less time tending to and cleaning the house itself and that has been wonderful. I wish I could dive in fully and completely share the transformation that our family has gone through since downsizing our house. But, I simple can’t share it all just yet. To sum it up, my marriage is stronger and our children are happier. When I look through things like the photo on my Facebook or Instagram, I see clearly how much downsizing our house was the right choice. In our previous home all of our photos were inside the house…because that’s where we spent most of our time. Now, all of our photos are out and about. We’re traveling, camping, climbing waterfalls, hiking, swimming, laughing, exploring and it is all amazing. As of January 31, 2019 we are completely debt free with the exception of our mortgage! It feels so awesome to not owe any credit card companies anything and to know that our cars belong to us. We have no student loans. Nothing. Now that we are done paying off debt, our plan is to build up our savings. For right now we should be able to save about 30% of our monthly income and that feels awesome! The hardest part about leaving our last house was the neighbors for sure. We had built a great relationship with our neighbors in the few years that we had spent in that house. Although it was hard to say goodbye to them, we have maintained our friendship and haven’t looked back. We have had absolutely zero regrets about downsizing and in fact, we have talked about doing it again. The freedom that you find with a smaller house is something we have fallen in love with and would gladly do it again were we to find a house we loved more than this one. I am so thankful my family and I made this leap. So thankful we downsized. It’s crazy how when you get rid of the things that don’t matter as much, you get an amplified amount of the things that do. It would be easy to look back with anger at the silly choices we made back then, but without them, I wouldn’t be living the life I am today. I believe that harsh reality check made me appreciate the more important things in life. It lead me toward minimalism and letting go of material items. Our mistakes lead us to financial peace and a stronger family and I wouldn’t change that for the world. If you have been having that nagging feeling that minimalism or downsizing is right for you, I have several posts that you might find useful in your journey.